Short Info: Here is the latest news for those aspirants who are waiting for Indian Coast Guard Recruitment 2019. 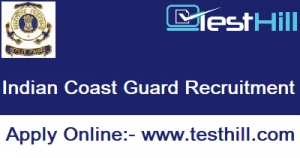 Join Indian Coast Guard has released Coast Guard Recruitment notification. There are various vacancies for Join Coast Guard Yantrik (02/2019 Batch) (Male Candidates). Candidates who are interested in coast guard recruitment they should apply Indian Coast Guard online. Candidates are suggested to apply online before the deadline. You can check Join Indian Coast Guard recruitment details like Indian Coast Guard salary, educational qualifications, age limit, and others from this portal. You have to appear in Indian Coast Gaurd Written Examination to grab this opportunity and for that, you should have knowledge of Indian Coast Guard Syllabus. Engineering Approved by AICTE with 60% aggregate marks. Join Indian Coast Guard application form download will start from 11th Feb 2019. You can check Join Indian Coast Guard notification from here. Candidates need to visit the official portal with respect to making Coast Guard Application. After making online application, you have to participate in the written examination to qualify the selection process. Interested aspirants who will apply for Indian Coast Guard Recruitment 2019 should download Indian Coast Guard Admit Card from the official website before the examination.